In the book Sri Hari-vamsa (2nd chapter of the Visnu-parva) it is written that Hamsa, Suvikrama, Kratha, Damana, Ripu-mardana and Krodha-hanta, who are known as the sad-garbha (six unborn children), are the sons of the demon Kalanemi. They performed intense austerities to worship the universal grandsire Brahma, unbeknown to their own grandfather Hiranyakasipu. Brahma, being satisfied with their extreme penances, granted them the boon of protection from death according to their prayers. Later, when Hiranyakasipu heard about this incident, he became enraged and said, “You have worshipped Brahma without letting me know, thus I have no affection for impudent people such as you. Your father himself will kill all of you. In your next life all six of you will take birth in the womb of Devaki and your father Kalanemi will be born as Kamsa. That very Kamsa will be your murderer.” Due to this curse of Hiranyakasipu they took birth in the womb of Devaki and were killed by Kamsa, the incarnation of Kalanemi. Prior to this, they were well known by the names Smara etc. and were the sons of Marici Muni. They laughed after seeing the universal grandsire Brahma running after his own daughter. Due to this offence of looking down on a great personality, they had to take birth as demons. It cannot be harmonized by the intelligence of ordinary jivas. To display the fullness and completeness of bhakti, all these inconceivable pastimes of Sri Bhagavan are manifested. 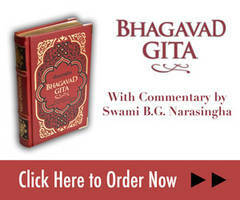 Therefore, the real significance of this is – the symptoms of devotion such as sravana, kirtana etc. reside within the devotees. Within that womb based on its fruitive results are the six desires of material enjoyment that are its companions (the five knowledge-acquiring senses and the mental faculty). “Alas, all these will drag me into the dark well of material life”– when such fear arises in the heart of a devotee, the desire for material enjoyment will be vanquished in time, then the glories of the Lord, namely the devotional cultivation of hearing and chanting, attains immense maturity. Only at that stage of mature devotion will Bhagavan with His form, quality and pastimes appear. Bhakti is the personification of pure goodness and reveals the Supreme Lord. Even the words of the sruti support this – bhaktir-evainam darsayati etc. meaning that only devotion can reveal Bhagavan. Because the sruti states that, ‘Marici manifests from the mind’ we may take it that Marici is an incarnation of the mind. Marici has six sons; hence they are the six sense objects of mental enjoyment (sound, touch, form, taste, smell and thought). Since Sri Bhagavan appears from Devaki she is considered the avatara of bhakti – the very personification of devotion. Because the sruti states, bhayat kamsah (‘the fear within Kamsa’), Kamsa is the personification of fearfulness, hence Kamsa is the avatara of fear. Therefore, just as fear of the material world destroys the six material sense objects from the womb of bhakti, similarly Kamsa kills the six children of Devaki. The well-wishing mother of prema-bhakti arises along with the glories of the Supreme Lord within the womb of devotion when material desires are extinguished Similarly, when the six sons of Devaki are eliminated, one should know that the seventh child appears as Anantadeva, who manifests as the abode, the resting place and the paraphernalia such as the bed, umbrella etc. of the Supreme Lord. Just as the Supreme Lord Himself appears after the appearance of prema-bhakti, so Sri Bhagavan directly appears as the eighth son of Devaki. This is the purport of the appearance of the Supreme Lord within the womb of Devaki. "By rendering devotional service unto the Supreme Lord Vasudeva one immediately acquires causeless knowledge and detachment from the world." Devotional renunciation and the causeless attainment of knowledge mentioned here are in tandem with the aforementioned Bhagavatam verse (1.2.20). Mukta-sangasya means the renunciation and realisation concerning the truth of the Supreme that results from coming directly in connection with the Supreme Lord. When attachment arises towards Bhagavan, the mind is free from the influence of material desires. Until one develops distaste towards material things, realisation concerning the truth about the Lord, or directly experiencing His presence is not possible. Sri Krsna’s appearance does not become the subject of realisation in the heart. Without understanding the appearance of Krsna, the life of the living entity is in vain. "The only thing required is chanting the holy name of Krsna in the association of saintly devotees. By worshipping continuously, one obtains the lotus feet of Krsna." "When will Nitai-canda show His mercy to me? When will I feel the desire for material life to be insignificant? When will my mind be purified by rejecting material thing? When will I be able to see Sri Vrndavana?" This prayer has been sung thus. Sri Baladeva is the very personification of the sandhini-sakti that expands spiritual consciousness everywhere. Being non-different from his personal manifestation, in the form of Sri Guru, He delivers the message of Krsna for the aural reception of the living entities to purify their consciousness and free them from material contamination. Until this happens, the living entity will not develop eagerness to have darsana of the spiritual Vrndavana-dhama and the lotus feet of Krsna, the master of the dhama. "The blazing fire of material existence is burning the heart, and that fire is always increasing. If one associates with saintly persons and performs bhajana of Hari, then such activities act like water and extinguishes that fire." The sermons of pure devotional principles coming forth from the mouth of Sri Guru will extinguish the fire of material existence and simultaneously urge the core of the heart to cry out, “Where is my Vrndavana? Where are the lotus feet of Radhika? Where is the treasure of the life of Radha, the life of the gopikas, Syamasundara, the son of Yasoda?” When the mind is still contaminated by the filth of material desires, this intense cry does not arise in the heart. "Where is Krsna, the Lord of my life, the one who plays the flute? What can I do to find him? Where is the son of Nanda?" (Cc. Madhya 2.15). – then we cannot get Him. Bhaktasya bhajanottha srantis tad-darsanottha krsna-krpa – without the combination of the devotees personal effort and the Lord’s mercy, the rope that binds Him will always be two fingers too short. Guru-kripa hi kevalam (Only the mercy of Sri Guru can make it possible).